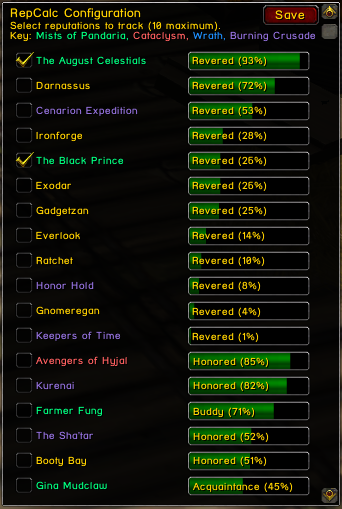 RepCalc is a standalone addon that allows you to create up to ten bars that will track your reputation with the selected faction(s). You can also click on the bars to see in your chat window how many (if applicable) of the associated dailies, items, etc. are required to reach exalted with that faction. /repcalc to open the addon or main window. /rcconfig to view the configuration window, or you can right-click the title bar. When the addon is first opened you will be given a list of your non-exalted factions in descending order. From there you can tick the boxes next to the factions you wish to track and click Save. It'll then bring up a bar for each faction that you can drag around by the title bar. 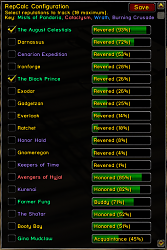 Left-click on a rep bar to (if applicable) display in chat the dailies/items required to reach exalted. Right-click to set that faction as your LFG bonus (will be indicated by a star). RepCalc also supports DataBroker addons. The mouseover will show your standing with each of the factions you have ticked in the configuration screen. You can also left-click to choose one of those factions to show on the bar itself, and right-click will open the configuration screen. Added the two new 7.3 factions and updated Armies of Legionfall calcs. Fix for Paragon factions after receiving the first reward. Added Paragon factions to be able to be tracked. Added faction colouring to the config for Armies of Legionfall, Talon's Vengeance and Conjurer Margoss. Added Talon's Vengeance, Conjurer Margoss and Armies of Legionfall factions. Removed fairly redundant calculations for Legion's factions greater tokens. Updated the reputation amounts rewarded by Legion items & world quests. Fix for changed garrison building function. Last edited by glupikreten : 11-13-12 at 07:22 AM.